Whenever you’re sending bulk email, or even email to more than a handful of recipients, it’s best to put them in an email recipient list. This is particularly true if you plan to send multiple emails to the same recipients. Otherwise, you’ll have to reference every recipient every time you send an email, and the packet will be large. You can avoid these issues by referencing a recipient list. 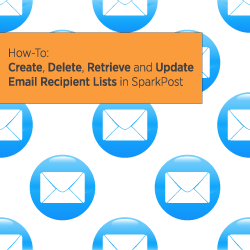 You can create, retrieve, update and delete recipient lists using the SparkPost API. A recipient list is a collection of recipients that can be used in a transmission. The Recipient List API allows you to manage these lists. When creating a new transmission, you can submit recipients “inline” as part of the transmission data or specify a stored recipient list ID attribute instead. When working with recipient lists, you have flexibility in deciding who does what. One person can be in charge of everything (using one API key) or you can implement separation of duties by having multiple API keys. One person can be responsible for creating recipient lists, someone else can be responsible for creating the templates and yet a third person can be responsible for creating transmissions. Each person simply needs his or her own API key with the appropriate permissions. This way, you have three different people working together but separately, and you can marry those functions together whenever you create a transmission. You can also use the SparkPost API to retrieve a list of all the available recipient lists in an account. This allows you to see a summary of all recipient lists. You can update an existing recipient list, but it will completely replace the existing list. If you would like to append to a list, we recommend retrieving the existing list, modifying the recipients, and then performing an update. If you’re in need of other resources for user engagement, check out these resources in our SparkPost Academy!